Happy Hump Day! Wednesday is the time when you start thinking the week is half way over and time to start planning the weekend…Yippee. We have a new way for you to enjoy the 4th Friday of the month. 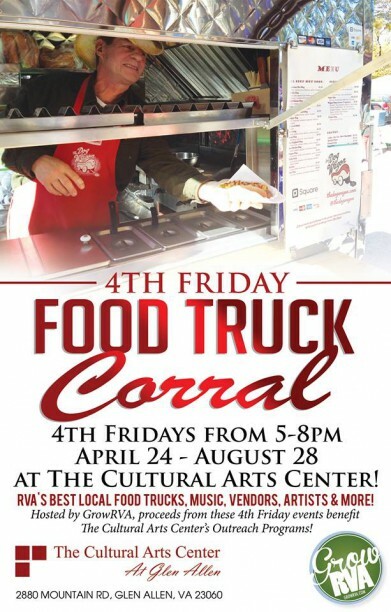 This is the kickoff of the 4th Friday Food Truck Corral at The Cultural Arts Center At Glen Allen, 5-8 pm. The event will support the outreach programs. You can definitely scratch cooking off the “to do list” because you will have great food surrounding you. There will also be jewelry, soaps, yarns, lotions and moisturizers. I couldn’t think of a better way to end the week by supporting local and enjoying yourself. Bring the entire family for a good time.